When I try to play pokemon moon it says “Your GPU may not support OpenGL 3.3, or you do not have the latest graphics driver” Can anyone help me? Are you on a Mac? If not, what is your GPU, and are it’s drivers up to date? If you are on a mac, what version is your OS? I am not on mac, I am on Windows 7. How do I see my GPU? 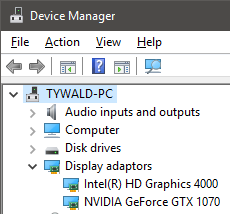 One way is to expand “Display adaptors” in Device Manager. Uploading a log file will also show it(see CitraBot’s link).